Browse up-to-date Rochdale Park real estate listings in North Regina below! Rochdale Park was one of the first subdivisions in the Twin Lakes neighbourhood. It is situated south of Whelan Drive, west of the Northwest Leisure Centre, north of Rochdale Boulevard, and east of Courtney Street. Rochdale Park real estate was developed in the late 1970’s and early 1980’s. Home buyers will find a variety of housing options to suit many lifestyles. There are a number of apartment-style condominiums and townhouse-style condos located along Rochdale Boulevard. The city bus also runs along this route and is convenient for getting you to downtown Regina, the University of Regina, or to a Saskatchewan Rough Rider football game! Take a look at the beautiful Rochdale Park homes for sale available below, or read more on this well-established North Regina neighbourhood. This area was designed with families in mind and is predominately single family homes. Many of the Rochdale Park homes for sale are bi-levels, bungalows, split levels and two-storey splits. The Northwest Leisure Centre is in Rochdale Park. The amenities at this facility include an indoor pool, sauna, whirlpool, outdoor rink (ODR), gymnasium and fitness room. The Doug Wickenheiser Arena (indoor) also shares space with the Northwest Leisure Centre. This busy facility offers figure skating lessons, hockey practices and games, learn to skate program, and public skating. Just outside the Northwest Leisure centre is beautiful Rochdale Park. 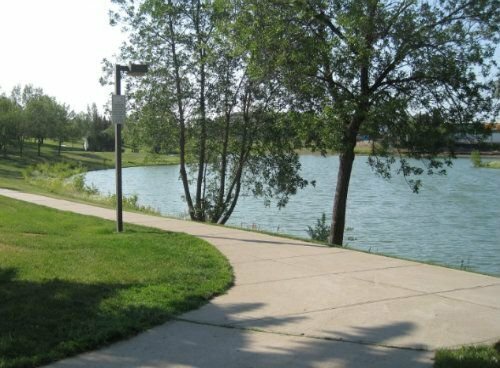 A paved walking path with charming wooden bridges encircles the large, well-developed storm water lake. On the shores of the lake is a play structure and benches. Bring the family out and feed the ducks and geese! Would you like to learn more about the latest Rochdale Park homes for sale? Please contact the Tourney Group online or call 306-789-1700 to get in touch with an experienced & local Regina real estate expert.